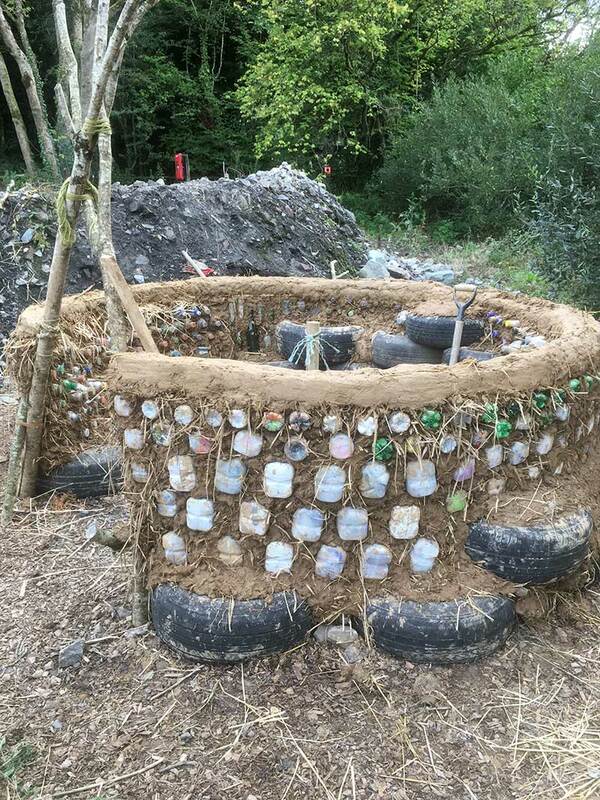 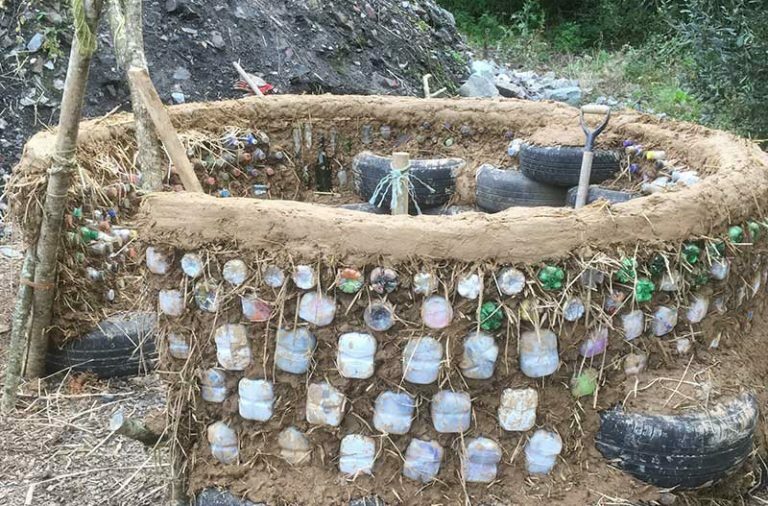 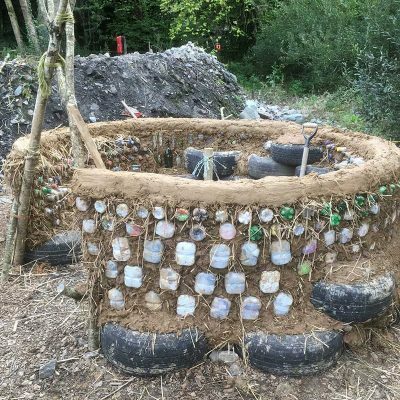 Some might argue that earth building is a thing of the past, but the Clayfest festival in Wexford demonstrated how it continues to be relevant today. 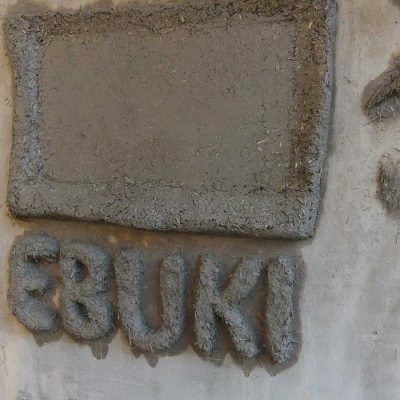 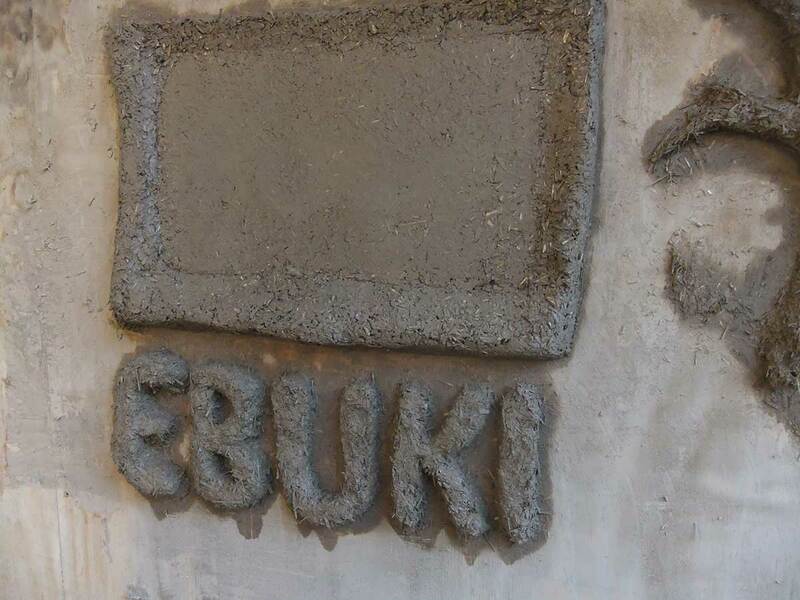 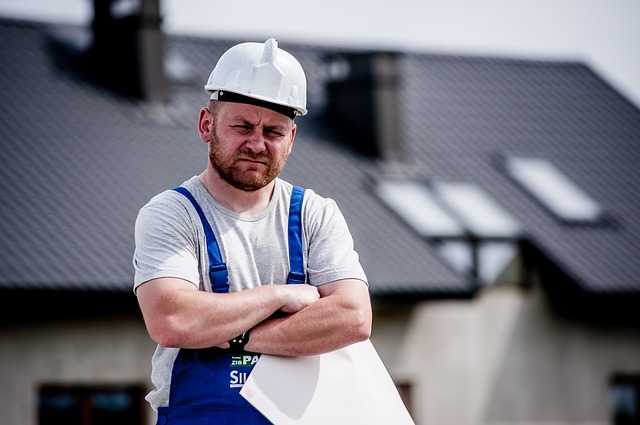 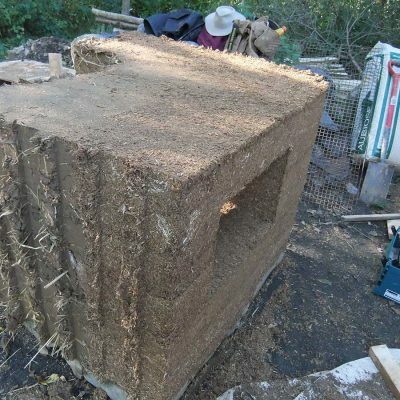 The reason building with mud is becoming increasingly popular is that it’s relatively cheap, albeit labour intensive, and it’s an eco-alternative to manufactured synthetic insulation materials and concrete. 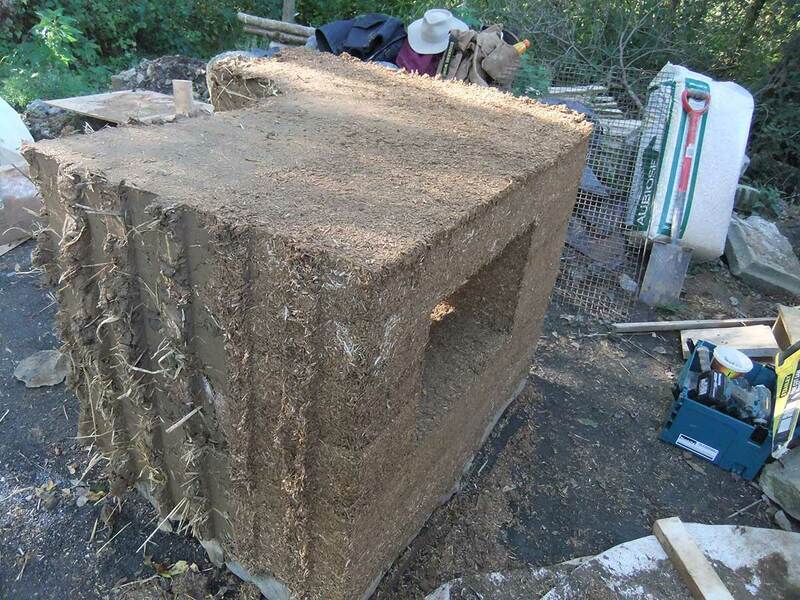 While it might seem that solid earth walls (mud mixed with straw) cannot provide much insulation, the thermal mass of such construction can keep a house warm. 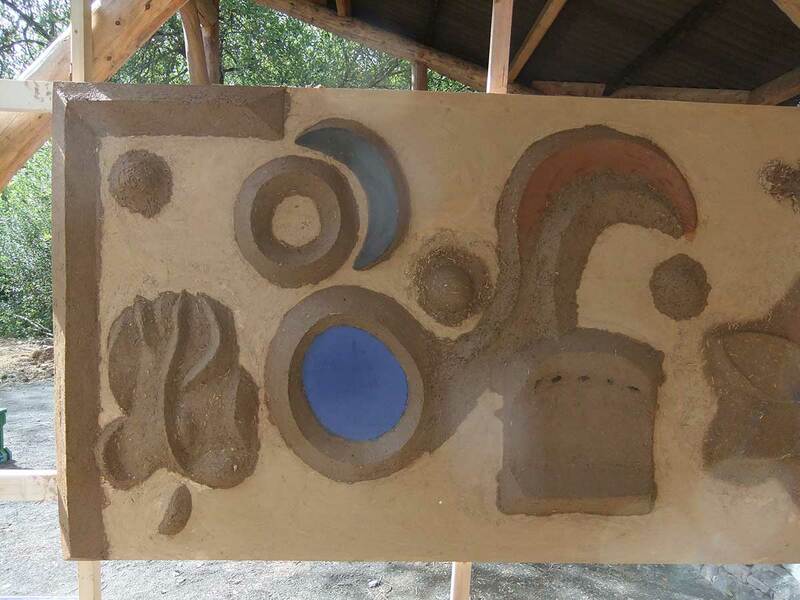 Earth walls also have additional health benefits by managing moisture, lowering humidity and creating a pleasant atmosphere. 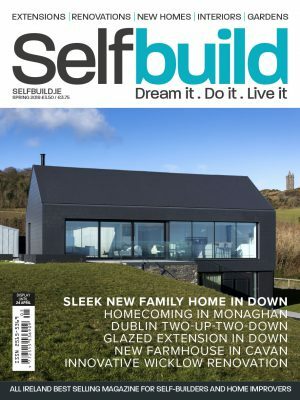 Much of the Irish population in fact lived in mud walled houses in the 18th and 19th centuries; Dr. Barry O’Reilly of Oxford Brookes University carried out an extensive audit of earth buildings throughout Ireland showing how widely spread was the use of cob up to the end of the 19th century. 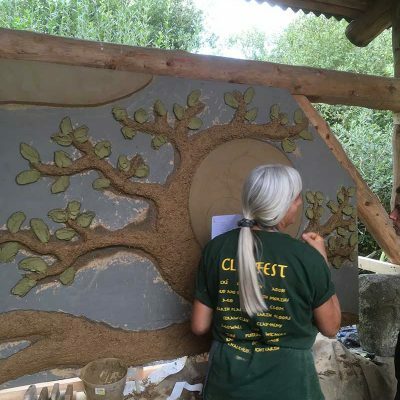 At Clayfest, Pat Ruane told the story of the Mayglass Farmstead in Wexford where a dilapidated mudwall farmhouse was restored and is now open to the public. 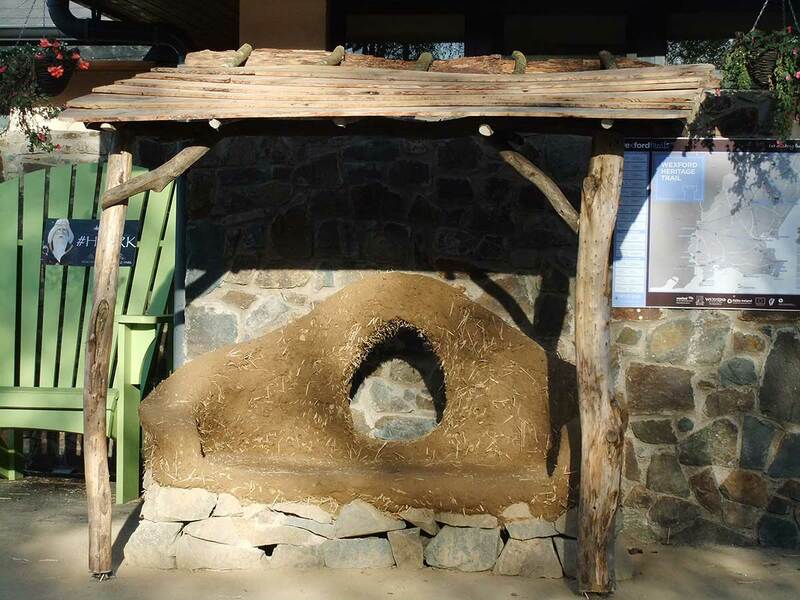 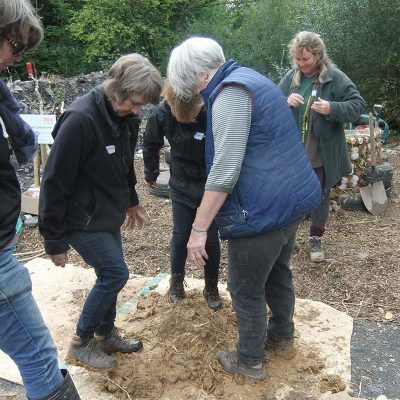 Workshops also demonstrated the use of earth plastered wattle and daub and the reconstruction of stone walls with earth and lime mortar. 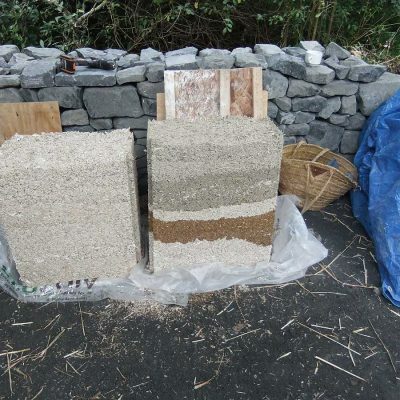 Féile and Colin from Co Sligo showed how old cob and stone houses could be renovated with earth materials. 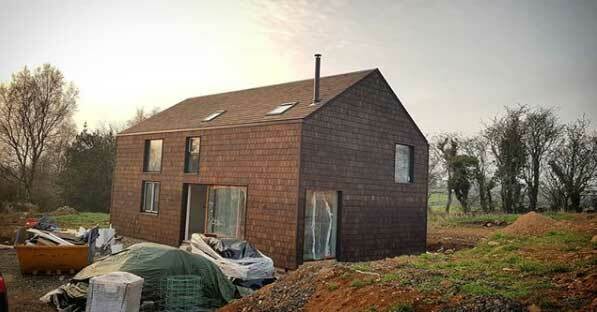 Earth can also be a modern material for new or renovated houses. 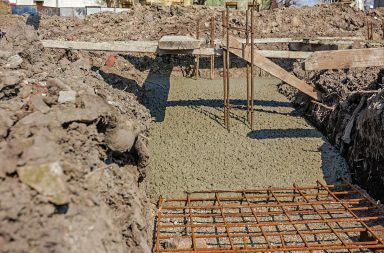 It can be dug up from the ground on a building site, providing it is clay rich sub soil, and used to build walls and even floors. 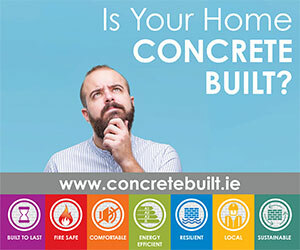 Louise and Iain explained, at the conference, how they are selfbuilding a house in Co Monaghan using solid earth walls combine with other insulating materials such as foamed glass to achieve contemporary insulation standards. 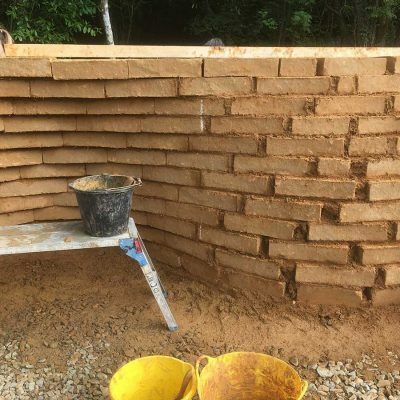 These walls can meet the building regulations’ thermal standards and can outperform lightweight walls due to the benefits of thermal mass and thermal storage. 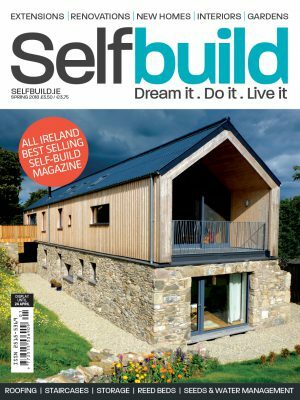 It is however important to point out that conventional U-value and energy/compliance calculations tend to disadvantage natural materials as they do not take proper account of thermal mass. 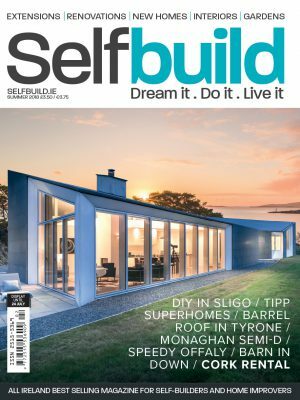 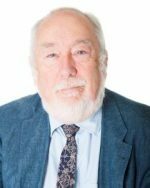 So while it is feasible that the nearly zero energy buildings (nZEB) performance is achieved with cob, this can only be demonstrated by building and testing real buildings. 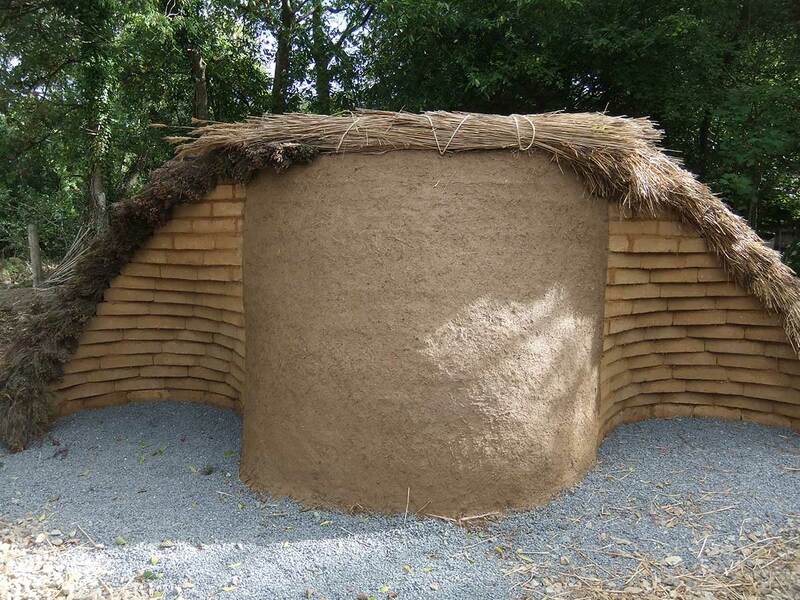 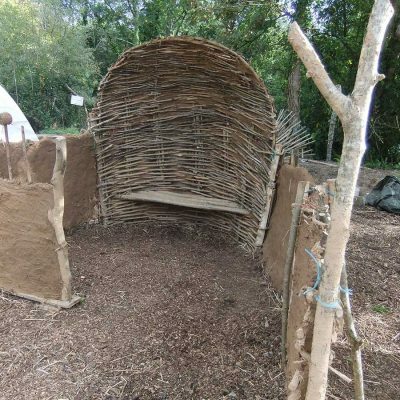 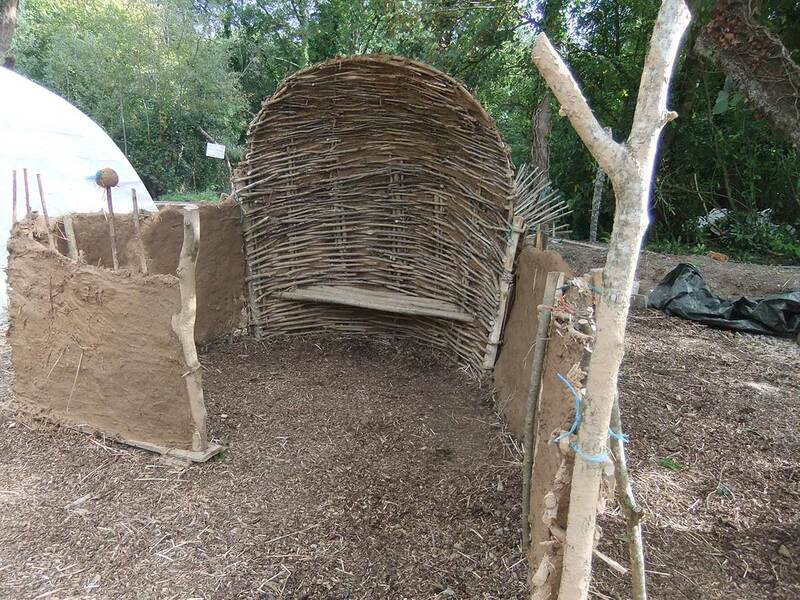 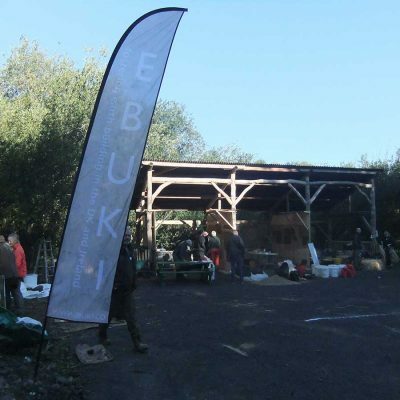 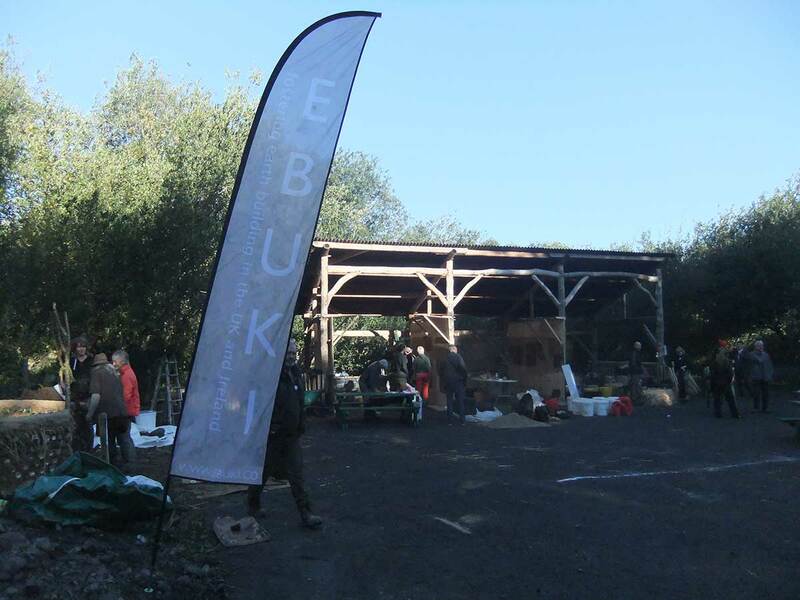 The CobBauge project experts from Devon (UK) and Brittany (France) built a 750mm thick structural wall section at Clayfest demonstrating how a two-layer combination of earth and straw plus earth with hemp can achieve the necessary U- values to meet current building regulations. 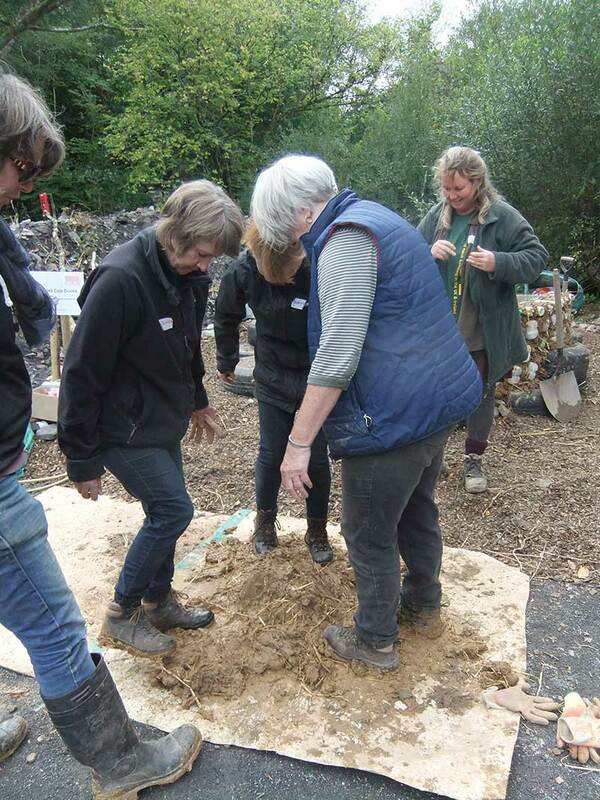 Another demonstration at Clayfest was of walling constructed with structural unfired earth blocks. 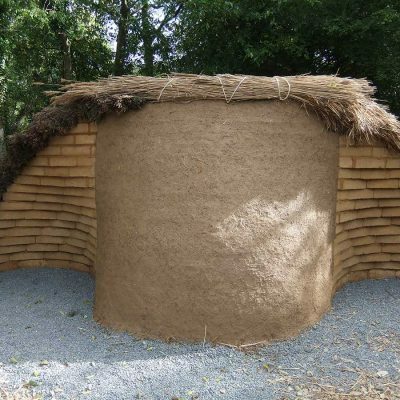 The blocks were built into a two-metre high curved wall by Tom Morton and Becky Little, earth experts from Fife in Scotland. 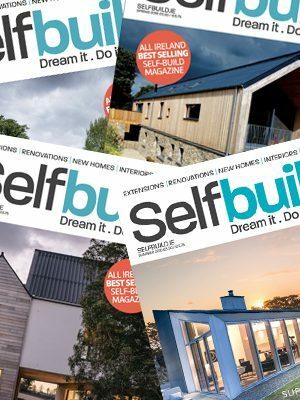 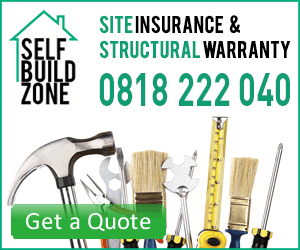 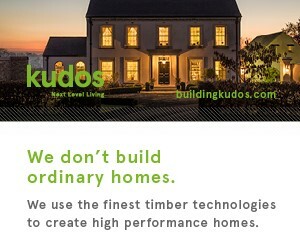 To meet the building regulations, it’s now common for self-builders to use timber frame as the supporting structure. 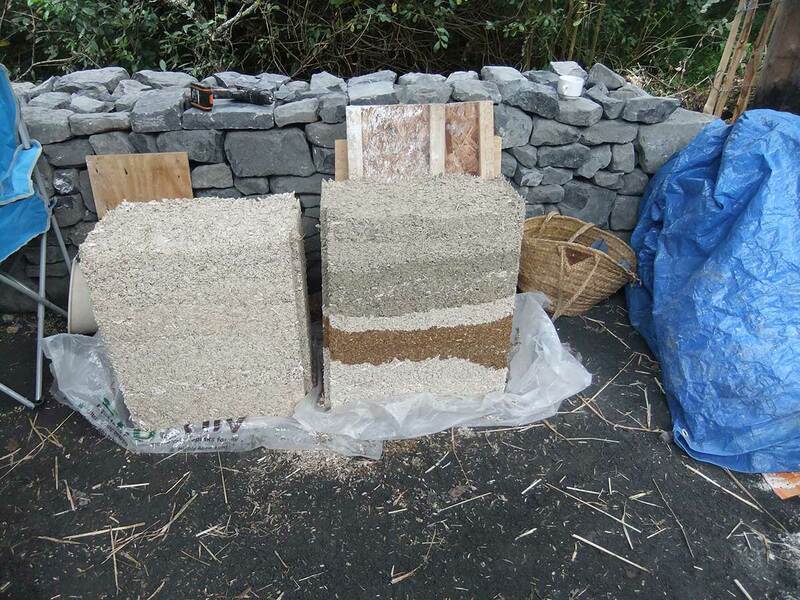 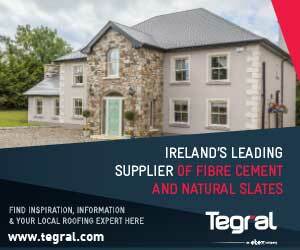 In NI we’ve developed a mix of hemp with powdered clay as an insulating infill to timber frame construction. 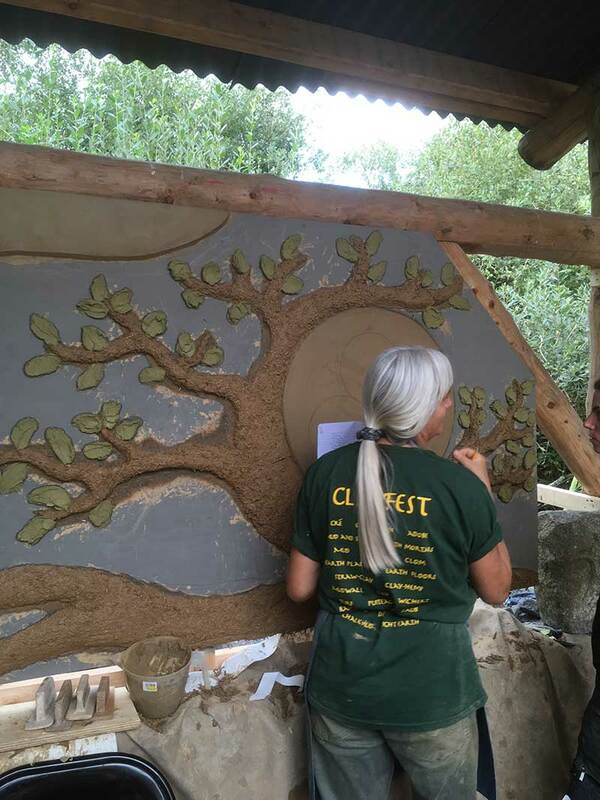 Several wall sections, only 300mm thick, were constructed during Clayfest showing how quickly this composite can dry out. 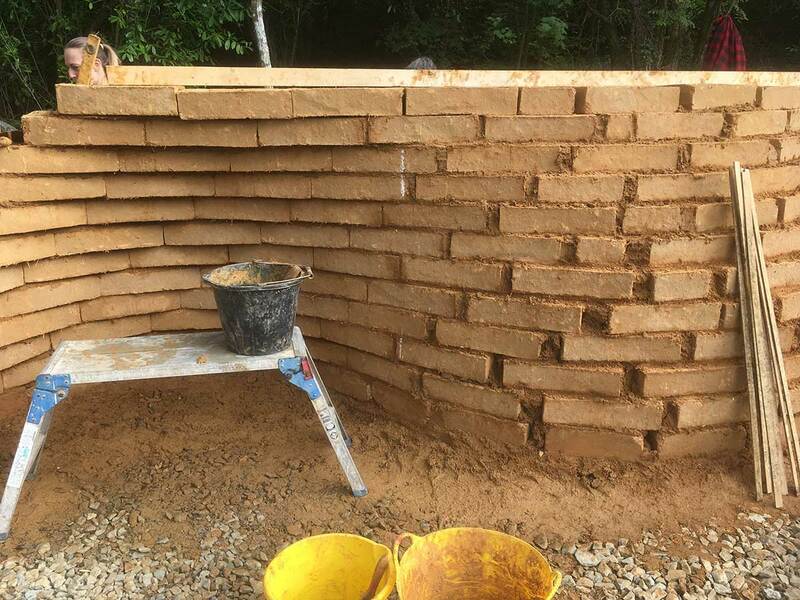 A wall section built on the Monday had dried out significantly by the Friday. 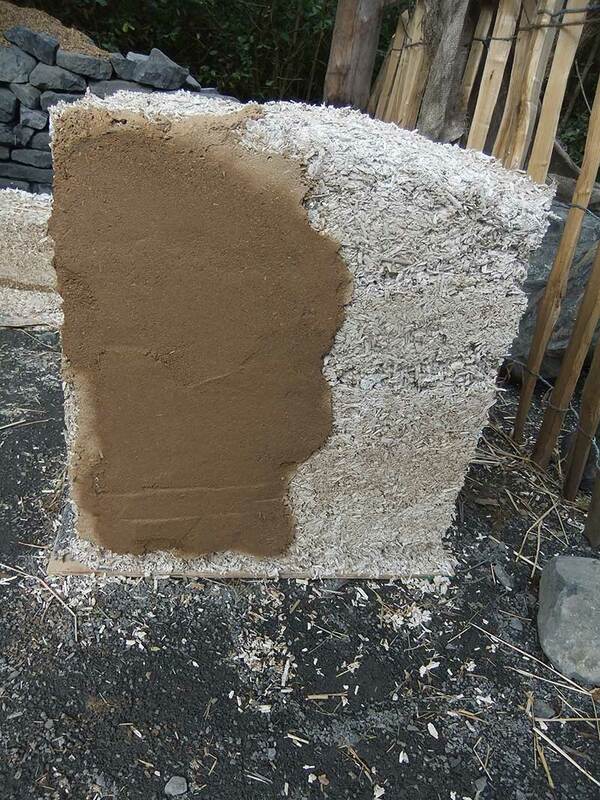 Hemp clay walls are an extension of the well-established hemp lime or hempcrete construction method, but with a lower embodied energy. 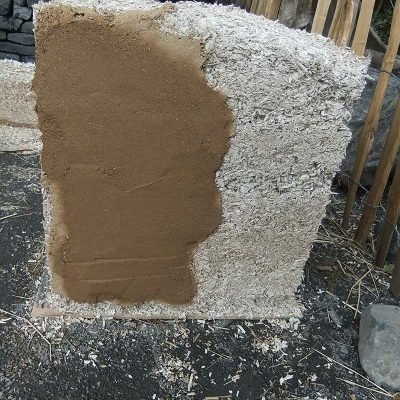 Strong walls of hemp and clay can achieve a very low density and thus excellent thermal performance with the additional benefits of breathability and moisture management. 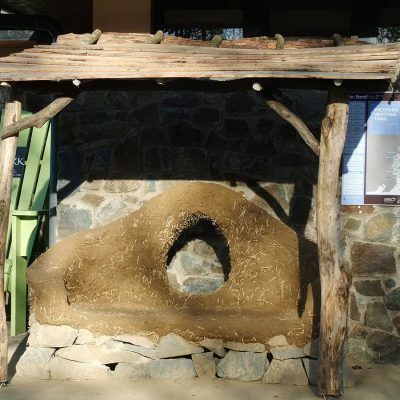 This project is undergoing more research (thermal testing as well as structural and advanced weathering) before a technical document can be issued in 2019. 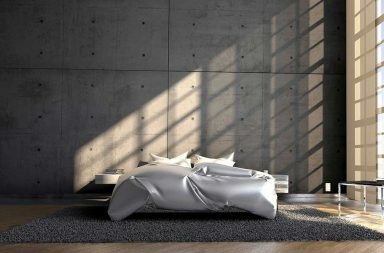 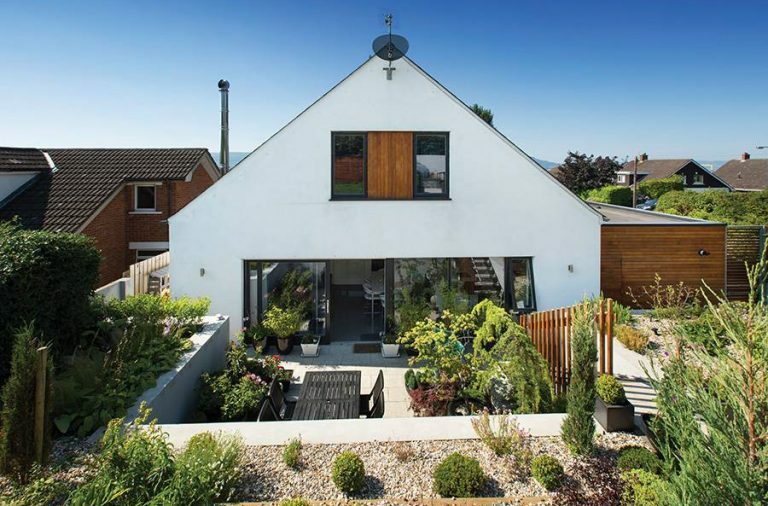 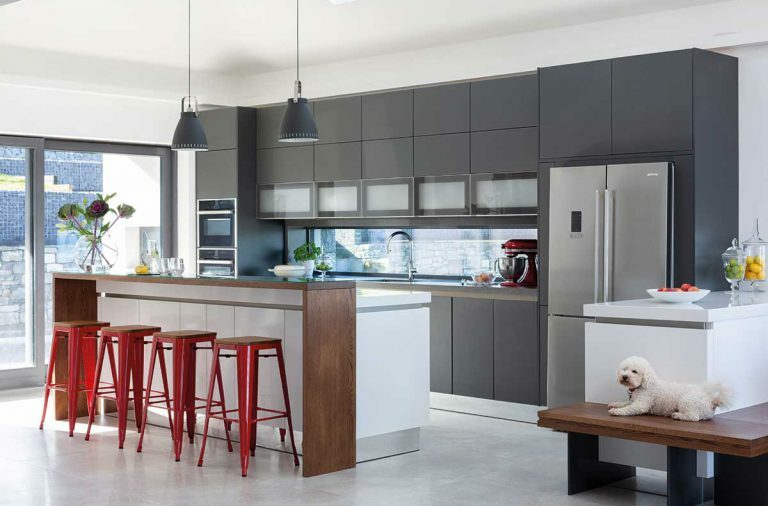 Even where walls are not built of earth, it is possible to use earth plasters to create very attractive and highly beneficial finishes in houses. 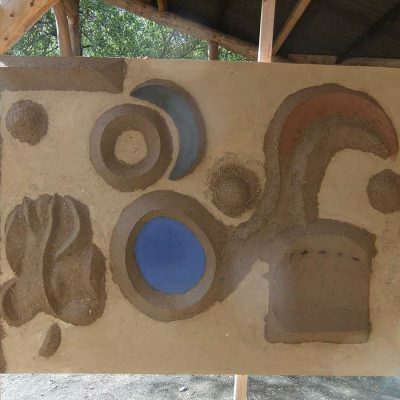 Athena and Bill Steen of Arizona (USA) demonstrated how to use local earth mixed with a little straw or hemp to make decorative clay finishes. 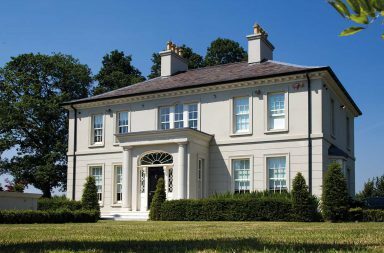 Manufactured clay plasters are also commercially available from a number of companies, many of them based in Devon (UK).